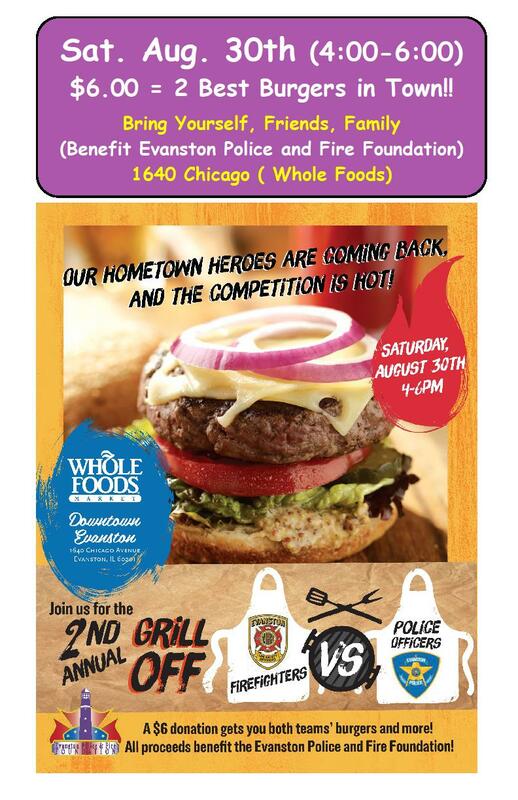 Great Grill Off - Evanston's firefighters v. police - Support our 1st responders, have fun, and get a Great Meal for $6.00 (two burgers!) and vote for your favorite! Today, Sat. Aug. 30 from 4-6 p.m. at Whole Foods (rooftop!) on Chicago Avenue in downtown Evanston. Whole Food will provide a VEGGIE OPTION !!! We invite all our friends and family to join in. The menu: the line-up is two burgers, a veggie slaw w/Doc’s Salsa, chips & salsa, dessert, and a drink. And, vegetarians can eat sides too - note that there won’t really be a way to have a separate grill from where all the meat is being prepared. The Prepared Foods Team at Whole Foods makes an outstanding veggie burger! You can also go into the store and order something and bring it back to the roof so you can join the party too! All proceeds go to the Evanston Police and Fire Foundation. Purchases in the store for the grill off will be rung it up as a donation to EPFF too!